Welcome welcome! It’s time for You Guest It! I just love this sweet series, you know? And not just because I get to be all lazy and slothful either – but also because I get to meet some really cool folks who make some pretty neat stuff. And then of course, there’s the part where I get to share it all with you. That’s pretty nifty too! Hello! My name is Emi from Hectanooga and I’m passionate about crafting, designing, and recycling! And when I can do all three at the same time, I’m very happy! 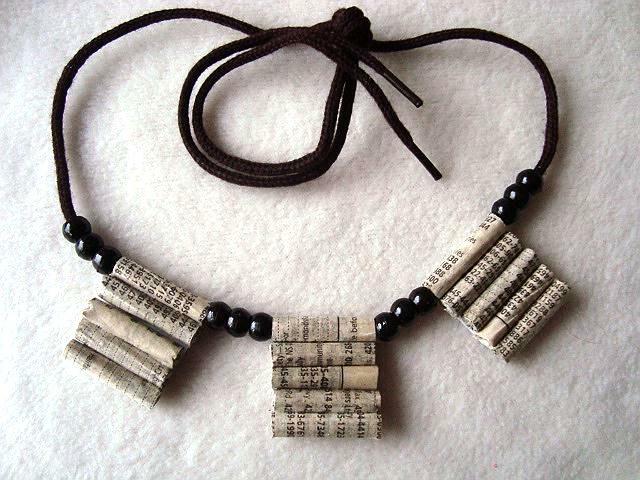 These stacked paper beads were inspired by a necklace I saw someone wearing on television. 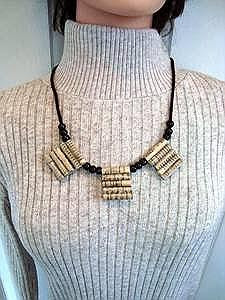 The necklace was similar in design – it was black metal – and I immediately thought: “Hey, I bet I could make that from paper!” These beads would look lovely painted black as well, but the print is a great conversation starter, and painting them would hide their origin! Want to know how I make them? Here’s the video that shows you how. Enjoy! Supplies are readily available, and there’s no wasting gas going out to buy supplies! It’s free. No expense for the supplies themselves! It’s green. Making something useful from throw-aways is always a good thing! It’s a challenge. Thinking up ways to use these things is always fun! Middle-of-the-night crafting is possible. You can always find something to manipulate into something else! It’s eco-friendly. It keeps things out of the land-fill. It’s very rewarding! Making something from virtually nothing is a thrill! Such a simple and pretty concept, Emi. Your choice to leave them au naturel is lovely too, and what a nice complement for the black beads! Thanks so much for joining me on the blog today and sharing your tutorial with us. As I mentioned up top, Emi is a do-er and a dedicated one at that. Her specialties include crochet, jewelry-making, and recycling – a woman after my own heart, eh? I don’t like to compare myself to others but, honestly, I’m feeling somewhat sheepish in comparison. Not only does she have a blog, and three Etsy shops (Hectanooga, M.E.H. Art Gallery and Hat and Scarf Patterns), but her Hectanooga YouTube site boasts… you won’t believe this… 595 videos. That’s 5-9-5! Is that not amazing? I thought I was doing well with 3. I have some serious catching up to do apparently. So go on now and pay her a visit, won’t you? I’ll see you back here in 3 years. P.S. Have an idea for an eco-craft? Consider submitting a guest-post idea to Michele Made Me’s “You Guest It”! Check out the details HERE. That is extra pretty – I do love the natural paper, as well as the nice large scale. Beautiful! 595??? Amazing. Wow! I'm so impressed! I love them and I actually have everything I need to make them. Michele, I too am in awe that Emi has so many videos! Thanks for having Emi as a guest.